Descartes has often been called the 'father of modern philosophy'.His attempts to find foundations for knowledge, and to reconcile the existence of the soul with the emerging science of his time, are among the most influential and widely studied in the history of philosophy. This is a classic and challenging introduction to Descartes by one of the most distinguished modern philosophers. 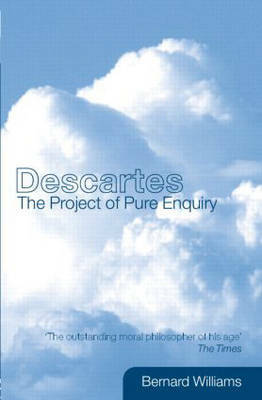 Bernard Williams not only analyzes Descartes' project of founding knowledge on certainty, but uncovers the philosophical motives for his search. With acute insight, he demonstrates how Descartes' Meditations are not merely a description but the very enactment of philosophical thought and discovery. Williams covers all of the key areas of Descartes' thought, including God, the will, the possibility of knowledge, and the mind and its place in nature. He also makes profound contributions to the theory of knowledge, metaphysics and philosophy generally. This is essential reading for any student of philosophy. This reissue includes a new foreword by John Cottingham.